İdman Yurdu supporters had to wait long 9 months to see their first game at the city's new stadium. Despite opening in June 2013, football began to play there yesterday. 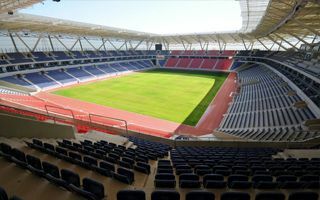 Worth €100 million, the new Mersin Arena was opened in mid-2013, when it hosted the opening and closing ceremonies of 2013 Mediterranean Games. No sports events were held at the stadium during the Games and in following months. Things changed yesterday, when İdman Yurdu played their first match. The new anchor tenant of Mersin Arena only released tickets on sale on Thursday and still managed to draw great crowds for the rather dissapointing 0-0 draw against Gaziantep BB in the country's second league. Despite an anticlimax on the pitch, in the stands it was quite the opposite. With great vocal support İdman Yurdu broke a new crowd record at 21,000. Previous one, set decades back, stood at 12,000.